Bali is famous for the Ubud Monkey Sanctuary, but there are actually a bunch of other monkey sanctuaries like it that are spread out over the island. One of these is Alas Kedaton, which is home to hundreds of monkeys and also some huge flying foxes. Alas Kedaton Monkey Sanctuary is a 30 acre jungle habitat surrounding an old Hindu temple in Tabanan, Bali. If you went to the Ubud Monkey Sanctuary and liked it, then you may enjoy this one too. If you haven’t been to the Ubud one yet, skip this place and go to Ubud first. It’s a better overall experience. With that said, one positive is that the monkeys here are much more peaceful and less aggressive than the ones at Ubud or Uluwatu. I think it’s because this place is way less crowded and the monkeys don’t have so many people feeding and scaring them. If you’re wanting to take good pictures of monkeys, this place is probably a better bet than the other monkey sanctuaries in Bali. The monkeys here are really relaxed and easy to photograph. Aside from that, the facilities and management here are not so great. The park is depressingly dirty and run down, and there are starving stray dogs walking around. The Ubud monkey sanctuary is in much better shape, and it’s just a much better overall experience. The main draw of Alas Kedaton is the huge fruit bats (aka flying foxes) that you can see here. Some of them are tame, but others are wild and you can see them perched high up in the trees. 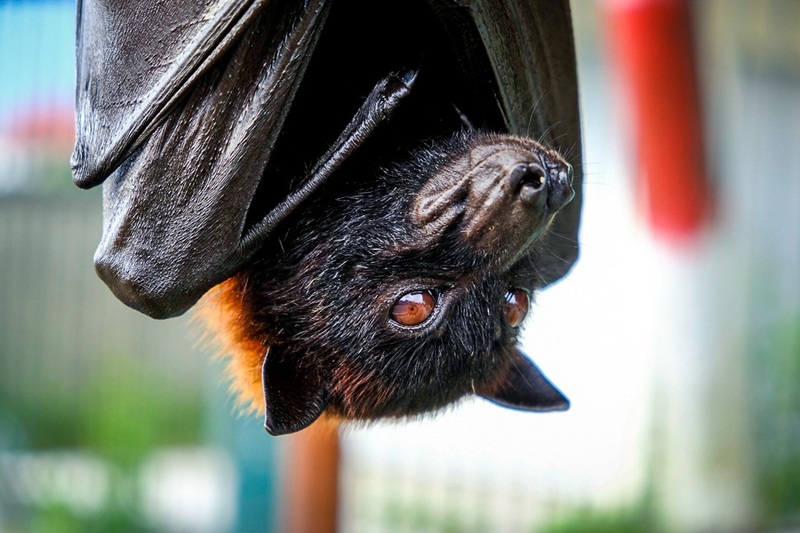 The fruit bats are super friendly and love interacting and climbing on people. These are native to Bali, and they normally live in the treetops here at the monkey sanctuary. None of the animals are chained or caged, and they seem to be healthy and treated well by the guides. You can pay a small fee to have your picture taken with the bats, and they seem to enjoy the interaction. 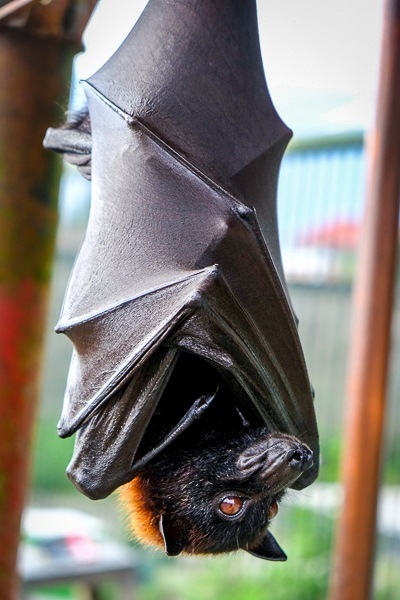 These kinds of bats look really scary, but they eat only fruit so they are not dangerous to people at all. Still, I don’t know how clean they are, so you might want to bring some hand sanitizer to use after handling them! It’s hard to describe what these things are like and how they behave, but the closest comparable animal would have to be dogs or foxes, so the name makes sense. In any case, they are not shy and they love interacting with people and climbing on their arms. I even saw them licking peoples’ fingers (no thanks!). One of the coolest features about these bats is the huge transparent wings. When they spread them out on a sunny day, you can see right through them. The Alas Kedaton monkey sanctuary is located in Tabanan. The entry fee is 35,000 IDR ($2.50 USD). When you enter the park, a guide will walk with you and carry a stick in case any of the monkeys act aggressive. After the tour, they will take you to a souvenir shop and ask you to buy something. These are overpriced, so you can politely decline, but a tip is appreciated.